- For six consecutive years, Le Blanc Spa Resort has been named a AAA Five Diamond resort. 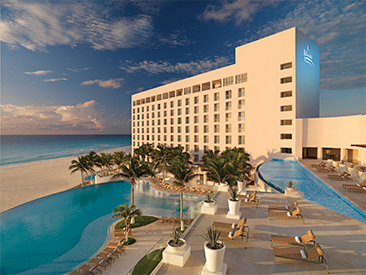 The award recognizes "the highest level of excellence in every facet of operation" among major North American hotels. To make sure your every wish is attended to, there's a full-service butler on every floor from 7 am to 11 pm. Should you desire a personalized wake-up call, dining reservations, ironing, spa reservations, tour arrangements or just about anything else, all you have to do is ask. Your butler will also bring you coffee and a newspaper every morning. A special feature of Le Blanc Spa Resort is the lovely private laguna (lake) framing the front of the resort, which is connected to Cancun's ancient Mayan Nichupte Lagoon. The Le Blanc Spa is a world unto itself where a full menu of treatments is available including: facials, Shiatsu massage, underwater massage therapy, body wraps, seaweed scrubs, hydro-reflexology and aromatherapy. Signature treatments include the 80-minute Therapeutic Bamboo Leaf Massage designed to stimulate vital energy centers and increase circulation; and the 50-minute Steam-Vichy Rain Journey, featuring a soothing exfoliation, an aromatic body mask and a refreshing Vichy rain shower. This unique mix of Asian and European traditions offers an experience of refreshment and rejuvenation for your mind, body and spirit. Guests will find twenty-four indoor and outdoor treatment rooms including five romantic outdoor massage areas & Spa Pavilion couples suites. All guests staying a minimum of 3 nights enjoy unlimited, complimentary access to the exceptional hydrotherapy area. Subject to space availability, and prior reservations are required upon check-in. Hydro-treatments are extra. What better place to have a wedding than a resort where the only standard is perfection? Le Blanc Spa Resort offers a variety of wedding packages and reception options that expert on-site planners will tailor to your wishes, no matter your faith. Perhaps a small, private ceremony suits you. Or maybe you want to be surrounded by all your family and friends on the most special day of your life. No matter what you have in mind, your dreams can come true at Le Blanc. A number of wedding packages are available and must be booked and paid for directly with the hotel and are eligible for the RESORT CREDIT! Le Blanc Spa Resort is not the average meeting destination. On the contrary, La Blanc is the ultimate choice for your most exclusive and elite groups, from executive board meetings to high-profile incentive groups. Le Blanc accepts special groups from 20 to 300 guests. Event planning experts will work with you every step of the way to help you meet and exceed every objective. Le Blanc Spa Resort guests can pre-book a variety of exceptional spa packages guaranteed to soothe and relax as well as golf packages at two challenging, beautifully landscaped, 18-hole championship courses that host major tournaments each year. Choose from the Jack Nicklaus Signature course in Cancun, the Moon Spa and Golf Club; or the newest golf course in the Cancun/Riviera Maya region - the Jack Nicklaus-designed Riviera Cancun Golf Club. Or play both! These are among the best courses in Mexico, and you owe yourself the pleasure of this exceptional golf experience! The $1500 Resort Credit cannot be applied towards the purchase of golf and spa packages (but can be used for purchasing individual treatments or rounds). Optional golf package available includes unlimited rounds of golf per adult, per stay, transportation to and from the courses, beverages and snacks. Cart fees apply. Palace Resorts takes golf to a new level by bringing the Jack Nicklaus Academy of Golf to its two golf courses located at the Riviera Cancun Golf & Resorts and Moon Spa & Golf Club in Cancun. The Academies give guests the opportunity to improve their game regardless of skill level. Students can learn firsthand the techniques and playing philosophy of Jack Nicklaus under the guidance of certified instructors and with integrated state-of-the art technology. *Romantic dinners are for adults and for couples only, does not apply to parties of more than 2 people. Reservations are required based on availability and location. Amounts shown are the maximum Resort Credit that can be applied toward each product/service, accumulating to US $2,500 per room/stay (12+ nights); US $2,000 (9-11-night stay); US $1,500 (5-8-night stay); US $750 (4 night stay); US $500 (3 night stay). Accommodation categories with more than one room will receive the amount of Resort Credit per room per reservation. Reservations for services and amenities must be requested at the resort upon arrival and are subject to availability. Resort Credit is cash on your hotel account and cannot be reimbursed in cash. All used Resort Credit amount is subject to a 16% operational fee. Promotion does not apply to Famtrips, travel agent or employee rates, complimentary, incentive or compensatory stays. Not combinable with any other unused credit. Unused credit cannot be reimbursed in cash, is valid for up to 1 year from the checkout date, is transferable once to one guest, and does not apply towards spa treatments. International Calling:Only calls made to Mexico (fixed lines), USA (excluding Alaska, Hawaii and Caribbean) and Canada are included. 16% tax will apply for the remaining regions and must be paid at checkout.Golf: Valid toward rounds of golf at regular price, lessons at the Moon Palace Golf Academy in Mexico, but not toward club/shoe rental, purchase of other products. Includes transportation to Riviera Cancun Golf Club. Transportation, food and beverages are included at Moon Palace Golf Club and Riviera Cancun Golf Club. At Grand Coral Golf Club transportation is included, only food and beverages are not included. * Scuba Diving: Resort Credit at Cozumel Palace can be used towards diving (2 tanks) for certified divers or for beginners and non-certified divers guests can opt for Discover Scuba Diving. The maximum amount for this activity depends on the length of stay. For Isla Mujeres Palace the maximum amount for diving (1-tank) or Discover Scuba Diving is US $300 for a stay of 5–8 nights and US $150 for stays of 3 or 4 nights. 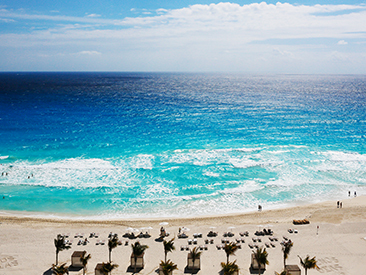 The remaining balance of the Come Back Soon Card will not be valid towards Scuba Diving at Isla Mujeres Palace. 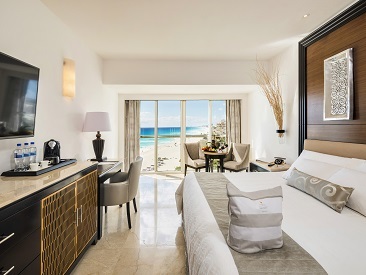 Le Blanc is now offering guests the latest technology in mobile applications so they can customize their vacation experience at their fingertips! Order room service, make spa appointments or book a tour before you even arrive with Le Blanc's new mobile app, which allows guests to access hotel services in real time. The Le Blanc app is available as a free download from the iTunes App Store and Android Play Store. Important Note: The 'Honeymoon Package' does not include a room upgrade to Royale Honeymoon Suite - couples must select preferred room category at time of booking. Celebrating couples will enjoy a complimentary welcome package. Select the complimentary Honeymoon & Anniversary package at time of booking. The Honeymoon Package must be requested at time of booking. The Honeymoon couple must present proof of marriage within the past year. After the Honeymoon couple checks in at the Front Desk, they will be directed to the Honeymoon Desk where they will be officially welcomed and given the opportunity to reserve their candlelight dinner. The additional amenities will be delivered to their room. Please Note: Guests must be at least 18 years of age.